1. ఏపీ డిప్లొమా ఇన్‌ ఎలిమెంటరీ ఎడ్యుకేషన్‌ (2016-18 బ్యాచ్‌) సెకండియర్‌ పరీక్ష ఫలితాలు విడుదలయ్యాయి. 2. గత నెల 11 నుంచి 18 వరకు ఈ పరీక్షలు జరిగాయి. 3. డీఎల్‌ఎడ్‌ (న్యూసిలబస్‌) పరీక్షలకు 63,666 మంది విద్యార్థులు పరీక్షలను రాయగా వీరిలో 61950 (97.30 శాతం) మంది పాసయ్యారు. 4. డీఎడ్‌ (పాత సిలబస్‌) పరీక్షలకు 276 మంది హాజరు కాగా 162 (58.69 శాతం) మంది పాసయ్యారు. 5. విద్యార్థుల డమ్మీ మార్కుల మెమోలు www.bseap.org వెబ్‌సైట్‌లో ఉంచినట్లు ప్రభుత్వ పరీక్షల విభాగం డైరెక్టర్‌ ఎ.సుబ్బారెడ్డి ఒక ప్రకటనలో పేర్కొన్నారు. AP D.Ed Result 2018: The Directorate of Government Examinations Andhra Pradesh has released the result for the D.El.Ed second year examination held in September 2018. The candidates can visit the official website bseap.org to get their D.El.Ed 2nd Year September 2018 results. The AP exam Boar has already announced the results of the D.El.Ed (Diploma in Elementary Education 2016-18) batch and D.Ed Supplementary (Old Syllabus) 2nd year examinations that were held from September 11 to September 18 are released. In case the candidates wish to apply for recounting of marks, then they have to submit their applications along with fee challan directly to the concerned office on or before October 25, 2018. They need to mark each subject for which recounting is required. A copy of the dummy marks memo and a self-addressed envelope with required postal stamps should be enclosed to the application. The results are available on main.bseap.org. Andhra Pradesh Board of Secondary Education Known as Director of Government of Examinations, it is an independent department functioning under ministry of Secondary education, Government of Andhra Pradesh State and Diploma in Education Course first year and second year public examinations will be conducted every year by BSE AP board. Conduct of examinations were the most responsible of this Board. Now this year AP D.Ed 2nd year public examinations 2018 were conducted successfully by the AP board of secondary education as per its schedule in September by from 10 am to 1 PM. These exams were conducted by the separated Secondary Education Board of AP State. when is d.ed result sir? Above results will be released in this month compulsory....Wait for few days..
sireesha gaaru HRD minister gaare September 5th na DSC Notification release chesthaanani official announcement chesaaru, Kaani emaindi? So, officials icche statements aadhaarangane memu meeku information isthunnaamu..
Ika DSC Results aneve repu leda marusati roju anetatlu unnavi..Memu Facebook/TeachersBadi ane official page dvaara latest updates ni andishunnamu..
sir d.ed lo back log unna dsc ke eligibility undha? They play with student's life and future..
results Eee year lo vastaya.......! Maa results apudu vastayi sir ..
Plz sir conform ga chepandi. Today confirm. Surender reddy conviner told. Ana Results Release ia Date Confirm Ga chebite tension undaduga Please tell me Fact. 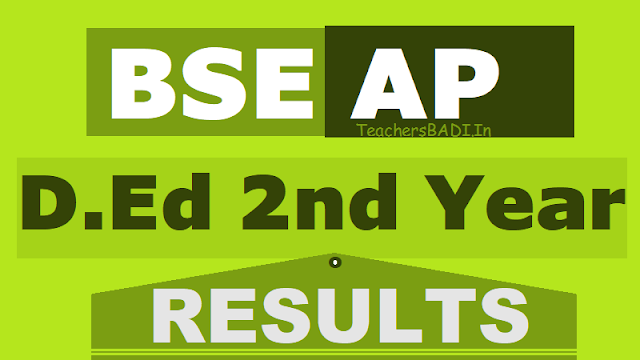 d.ed second year results epudu sir???? Dec 12 ani Scrolling on Tv9. HRD minister Ganta Srinivas Garu Kuda last Dec5 th Na 4/5days anaru. meeru mee college examination department ni meet avvandi..
ma collage 16 members ki records marks padaledu sir. endukalajarigindi. board maa jeevitalato adukuntundi. sir d.ed.2nd year 2015 batch results yepudu vosthayee..plz tel me..
sir died 2nd year results eppudu annoyance chestharu pls verry tensanga vundi..
when you release d.ed 2nd year results??? friends mana results already net'lo upload chesaru..bt education minister permission kosam waiting.so all the best. After Completion of With Held Candidates Exam/Special Exam..
After completion of Special Exams, results will be announced..
nobody have exact information ... for just time pass saying some date .. its not good and don't motivate students in wrong directions. read the replied comments...it is depending on bse officials..
sir A.P d.ed 2nd year result eppudu sir plzzzzzzzzzzzz cheppandi. Ap ded 2nd year result date when? Ap ded 2nd year results when? After completion of 2nd year special exams. Results will be declared in First week of February 2016..
AP D.Ed 2nd Year Special Exams 2016 complete aina thrvaatha total AP D.Ed 2nd Year results 2016 announce avuthayee..
when u will launch the results of ded 2015 out batch?pls menssion when u will launching date. sir D.Ed ii year (2014-16)results eppudu release chestharu? Sir 2nd year results Yeppudu sir.....????? 2nd year results Yeppudu sir.....????? Sir will you announce the ap D.Ed 2nd year results soon batch2014-16??????? Authorities will release iñ this month. be cool and have patience. 2015 DSC content old texbooks base chesukoni evadam jarigindhi. next dsc announce chesthe content malli old textbooks nundi esthara? lekha present school 2012 nundi run avuthunna new textbooks base chesukoni esthara? plz clarify me sir in that situation! Don't wait and think a lot about DSC notification. Study well for long term. Notification will be released by Govt as per vacancies and requirements. So, study well first.